Infection with Herpes simplex manifests in most people as fever blisters, or cold sores. The virus is also the cause of genital herpes. But Herpes simplex can cause far more serious disease (though this is relatively rare), as shown in the case that follows. Clinical data: This 1 year old infant boy was referred with a background of malnutrition and a week long history of sores in the mouth, convulsions and projectile vomiting. He had been stuporose for a day. On examination, the unconscious, moribund infant was found to have ulcers of the mouth and tongue. The child died during the examination. 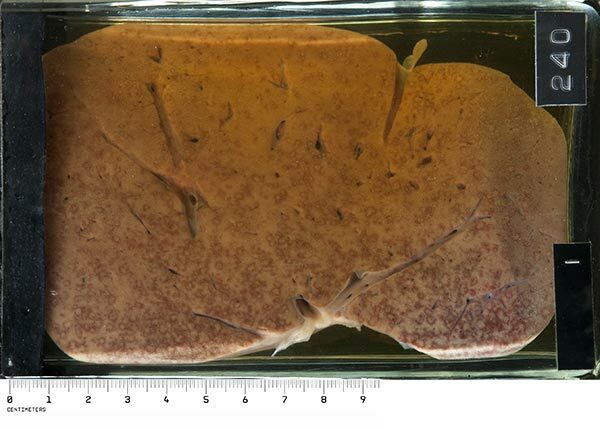 Macroscopically: The liver removed at autopsy shows features pathognomonic of herpes. Against the pale yellow background of a very fatty liver are innumerable circular white spots surrounded by a narrow well-defined rim of intense congestion. 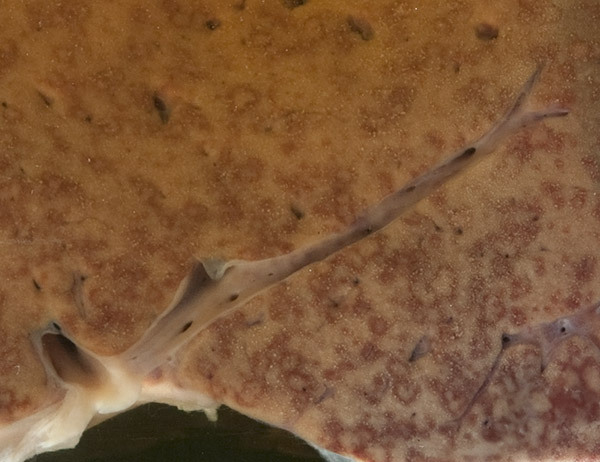 The lesions vary in size from pinpoint to discs 2 - 3mm across, and on the cut surface can be seen to involve the whole organ. 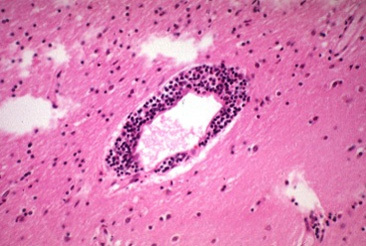 Microscopically: Each little macule is actually a focus of necrosis, and typical eosinophilic herpes intranuclear inclusions can be seen in the nuclei of the surviving hepatocytes around the area of necrosis. Surrounding the necrosis there is congestion of the liver sinusoids to give the deep red circumference to the lesion. There is an absence of inflammatory cell response. Comments: Generalised herpes is usually linked to immune deficiency states; this child had Kwashiorkor, where there is a severe defect in cellular immunity. In these cases, lesions are commonly seen in the oropharynx, oesophagus, liver and adrenal glands. Neonates born to mothers with genital herpes are also at risk for generalised herpes infection, especially if the mother acquires the primary infection in late pregnancy. These babies develop a severe septicaemic-like illness a few days after delivery; the clue to herpes infection may be a localised patch of herpetic blisters on the skin, typically on the scalp. Clinical data: The patient was a 26 year old woman who had a ‘flu-like illness a week prior to admission. One day before admission she developed headache, began to vomit, then became confused and had a generalised convulsion. A lumbar puncture showed protein 90mg/dl, globulin +++, 500 lymphocytes and 90 polymorphs. She died without regaining consciousness. 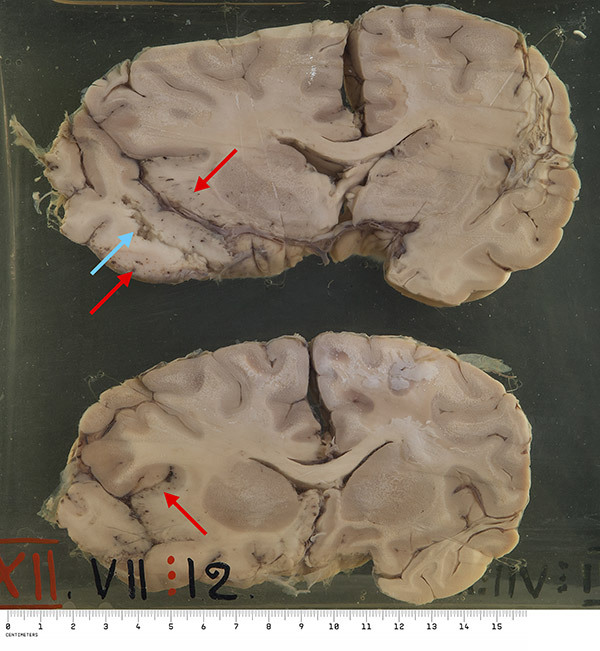 Macroscopically: Two sections of brain are displayed. An area of cerebral softening can be seen situated very superficially over the inferior aspect of the left temporal lobe. Associated with this are numerous pin point areas of congestion and haemorrhage. The meninges over this area are thickened and show the same haemorrhages and congested areas. Marked oedema of the left hemisphere is present, causing compression of the right side. Comments: Herpes encephalitis is a rare, sporadic disease that must always be kept in mind since it is rapidly fatal if not treated early with intravenous acyclovir. 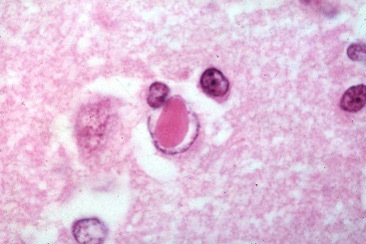 The diagnosis can be rapidly confirmed by Herpes simplex PCR on a sample of cerebrospinal fluid. The route of entry to the brain is believed to be either along olfactory nerve fibres and tracts, or by direct extension of virus from the trigeminal ganglion into the temporal lobe above.